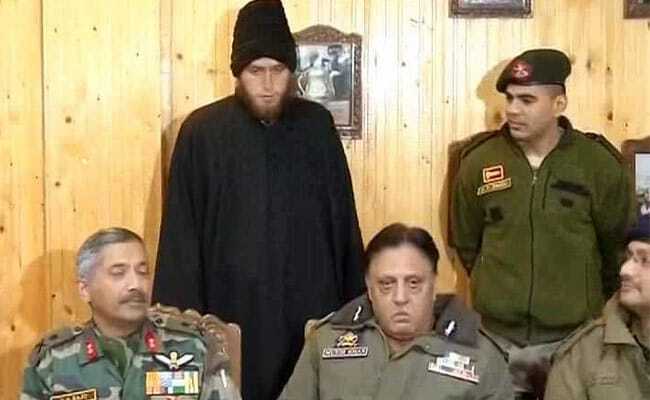 Majid Khan's mother Ashiya Begum had made emotional pleas on social media asking her son to come back home after she heard that her son had joined Lashkar-e-Taiba, a plea which forced him to return home. Majid Khan can be seen with policemen in this file photo. New Delhi: Former Indian Captain Bhaichung Bhutia has written to the Jammu and Kashmir Football Federation offering a training stint to Kashmiri youth Majid Khan, a footballer who recently returned home after quitting the Lashkar-e-Taiba (LeT). "I was very sad to read reports of Majid joining a terrorist organisation. Football has provided solace to many over the years and I felt he requires a platform to play the 'Beautiful game,' again," Mr Bhutia, the only Indian player to have played over 100 international matches, said today in a statement released by All India Football Federation (AIFF). "I have already touched base with the J&K Football Association offering him to train with Bhaichung Bhutia Football Schools in Delhi. I want him to train under my coaches and then we can decide where he stands as a player. I believe he deserves an opportunity and hence, felt best to open the doors for him," Mr Bhutia added. Mr Majid's mother Ashiya Begum had made emotional pleas on social media asking her son to come back home after she heard that her son had joined terrorist ranks, a plea which forced him to return home. "I also read that he has been a promising footballer since his childhood and has even won quite many trophies," the 40-year-old Padmashree awardee explained. "Once you start kicking the ball again, you never know, your lives may just kick-off again. We want Majid to come back to normal life at the earliest."